Citrus plants are highly susceptible to a disease commonly called “HLB” (Huanglongbing), also known as “citrus greening disease.” Agricultural Research Service scientists in the Quality and Safety Assessment Research Unit in Athens, Georgia, and the Subtropical Plant Pathology Research Unit in Fort Pierce, Florida, joined forces to use a technology known as “Fourier transform infrared-attenuated total reflection” (FTIR-ATR) spectroscopy to identify citrus greening-infected plant leaves with 95-percent accuracy. 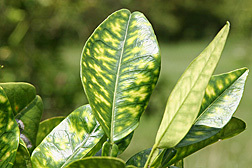 Citrus greening was discovered in Florida in 2005 and is rapidly spreading in the citrus-growing regions of the state. The disease is transmitted by the Asian psyllid, an insect found throughout Florida. Fruit from infected trees drops prematurely or fails to ripen. A 2007-2008 survey conducted by the University of Florida, in collaboration with USDA’s National Agricultural Statistics Service and the Florida Department of Agriculture and Consumer Services, included 153,000 net acres of oranges and 17,676,000 orange trees. The survey revealed that growers—to prevent spread of disease—removed 847,208 infected trees during the survey period. Plants can be infected for up to several years before showing symptoms, and during this period the psyllid can transmit the disease agent to nearby plants. Currently, the best method for detecting citrus greening-infected trees is a type of DNA testing called PCR (polymerase chain reaction), which is both costly and time consuming. FTIR uses light to identify chemicals and reactions in a sample. This technology has the potential to detect the disease before visible symptoms occur and is cheaper and faster. The mid-infrared region of the electromagnetic spectrum reveals dramatic changes that occur in leaves of infected trees compared to leaves from noninfected trees. The results from this technique’s application were published in the journal Applied Spectroscopy in 2010. The Athens team included chemist Samantha Hawkins, engineer Bosoon Park, physiologist William Windham, and research leader Kurt Lawrence. Hawkins used an FTIR spectrometer with an ATR crystal accessory to test for the presence of citrus greening. “We used a leaf removed from the citrus tree, dried it out in a microwave, and ground it into a powder—a simple protocol developed by Windham,” says Hawkins. A very small sample—just 0.1 milligrams—of the leaf powder was placed on top of an ATR plate. The system clearly discriminated HLB-infected leaves from healthy leaves. More work will be needed to discriminate HLB from other citrus diseases. “This is a great method because the sample preparation is faster and easier than PCR, which is typically used to get a value of how much disease is in the leaves,” says Hawkins. “Growers currently send leaf samples out for PCR analysis that costs about $6 to $8 per sample and takes several days. The FTIR technique is done in seconds.”—By Sharon Durham, Agricultural Research Service Information Staff. This research is part of Plant Diseases, an ARS national program (#303) described at http://www.ars.usda.gov/research/programs.htm. Samantha Hawkins is in the USDA-ARS Quality and Safety Assessment Research Unit, 950 College Station Rd., Athens, GA 30605; (706) 546-3454. Gavin Poole is in the USDA-ARS Subtropical Plant Pathology Research Unit, 2001 South Rock Rd., Fort Pierce, FL 34945; (772) 462-5940. "Identifying Trees Infected With Citrus Greening" was published in the August 2011 issue of Agricultural Research magazine.